Free and open to the public, VA/BF is the only international art book fair in Canada and one of only two on the West Coast. In 2014 the event is anticipated to attract over 1,500 visitors from across the Greater Vancouver Area and beyond. VA/BF will also produce Artists’ Books Week, a parallel series of events hosted in spaces across Vancouver by a variety of artists, curators, collectives and institutions across the city who are actively creating and presenting work in this medium. In 2014, the Fair will also coincide with the Vancouver Book Fair, taking place next door at UBC Robson Square, which features collectible, antiquarian and rare books. An exclusive first look at the 2014 Vancouver Art/Book Fair for Members of Project Space and the Vancouver Art Gallery. Become a member online or at the door. 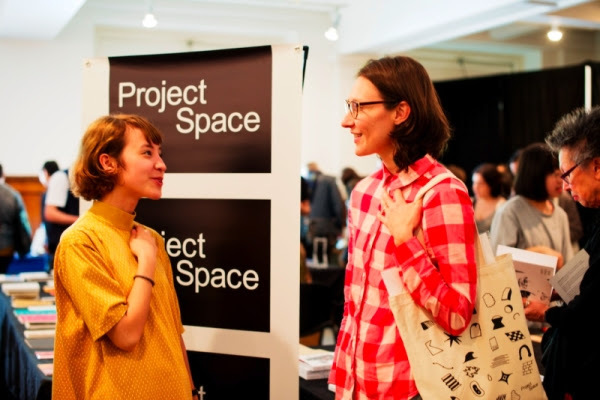 Project Space Members are part of a community that is passionate about artist publishing. Member benefits include limited-edition artist prints, postcards and totes with artwork by Tylor MacMillan (Vancouver), Ryan Thompson (Victoria), Heidi Nagteegal (Vancouver), Jp King (Toronto) and Viktor Hachmang (The Netherlands); copies of our new book by award-winning Nisga’a poet Jordan Abel, Un/inhabited, which is published by Project Space Press in collaboration with Talonbooks; and discounts on our publications and books at The Paper Hound Bookshop. Free and open to the public, the VA/BF Reception is a social event for exhibitors, presenters and the public the night before the Vancouver Art/Book Fair. The event doubles as the launch of the latest from ISSUE magazine, published by UNIT/PITT Projects. Jonathan Middleton, Director/Curator of the Or Gallery and Founding Publisher of Fillip, leads a conversation about artist-run centre publishing in Canada with Brynn McNab, Editor of the recently resurrected ISSUE magazine published by UNIT/PITT Projects, and Mariane Bourcheix-Laporte, who undertook a study of Canadian artist-run centre publishing for ARCA. Mariane Bourcheix-Laporte is an artist, curator and writer based in Vancouver. She received an MFA in Interdisciplinary Studies from Simon Fraser University in 2012. She has recently worked on arts research and advocacy projects with PAARC, ARCA and Pacific IMAA members. She is the Co-founder of the Montreal-based publishing collective palindromes and a board member of VIVO Media Arts Centre. Brynn McNab is a writer and general cultural labourer currently based in Vancouver. After graduating from Emily Carr University, she participated in a writing residency at PAF in France, and is currently the manager of UNIT/PITT Projects’ gallery and studio spaces, as well as the editor of the newly revived ISSUE magazine. She has had her writing published in various small journals and experimental magazines in Europe, Canada and the US. Jonathan Middleton is an artist and curator based in Vancouver and has served as Director/Curator of the Or Gallery since September 2007. Between 1999 and 2005, he served as Director/Curator of the Western Front Exhibitions. Middleton co-founded Projectile Publishing Society (1999) and was Founding Publisher of its art periodical Fillip (2004/05). He continues to serve as Chair of the society’s Board of Directors. Steeped in legacies of colonial-era bans on printing, modern censorship and contemporary market-driven publishing, Brazil finds itself a hotbed for independent and alternative book production. There is a steady rise in artist bookmaking, political printed matter and experimental forms of publishing. Rachel Gontijo Araujo of A Bolha Editora, an in-translation press active in these emerging movements, discusses working in collaboration with artists and makers from Brazil and around the world in an effort to break open dialogues of what we read, how we read and how books reach us in places where distribution has been historically limited. Rachel Gontijo Araujo is a writer and the co-founder of A Bolha Editora, a Brazilian press committed to publishing translated works in Portuguese, and to disseminating under-represented Brazilian works in North America. She is also the author of Primary Anatomy, excerpts from which have been published by or are forthcoming with Mandorla, Action Yes, Everyday Genius, Evening Will Come, Siprale, Recour Au Poeme and The & Now Awards: The best of innovative writing 2. Her collaborative translation, with Nathanaël, of The Obscene Madame D, by Hilda Hilst, was recently co-published by Nightboat Books and A Bolha Editora. Christopher and Kathleen Sleboda, founders of the small publishing house Draw Down and partners of the illustration-design practice Gluekit, discuss how their publishing project was set up as a platform for testing out ideas, both practically and conceptually, and how they continue to experiment with the deceptively simple marriage of form and content. They also discuss how their various other projects—all involving the acts of “making, curating, collaborating, collecting and distributing”—continue to overlap and inform each other. Draw Down is an independent publisher based in the northeast corner of the United States. Launched in 2012, it publishes small books with a focus on photography, graphic design, illustration and architecture. Draw Down is operated by Christopher and Kathleen Sleboda, partners of the award-winning design and illustration practice Gluekit. Lauren Mackler, Founder of LA-based Museum of Public Fiction, creates and performs “an exhibition as a lecture” that collides historic material on a topic with new contemporary works on the same theme. This idea, similar to the process with which Public Fiction makes publications, invites a deconstruction of the museum’s journal and the organization as a whole. Inspired by many performance/lectures and artists before her, Mackler presents this original talk as an amateur-expert on a topic and looks at fiction and literature as it plays into exhibition making. Lauren Mackler is a French/American curator and graphic designer based in Los Angeles. In 2010 she founded the Museum of Public Fiction as a forum to stage exhibitions and performances by contemporary artists in LA. A year later she launched Public Fiction, a quarterly journal that has the same mission in print. Mackler has organized exhibitions in Milan, Turin, Paris, New York, Tokyo and Los Angeles. She is a contributor to the Art Book Review and a senior lecturer at OTIS college of Art in the Graduate Graphic Design program. Ryan Smith, Founder and Operator of Brick Press, presents on do-it-yourself publishing practices that are based on salvaging equipment from closing print shops. Interested in how artists are preserving and maintaining printing methods that are disappearing as outdated machines are off-loaded by commercial printers, Smith will offer practical advice—such as how to combine community-based and commercial initiatives to sustain production costs—and examine some of the projects coming out of these practices. Operating as Brick Press with his own acquired set of machinery, Smith publishes the work of emerging artists and documents contemporary art through the production of exhibition catalogues. Ryan Smith is the Founder and Operator of three projects based in Vancouver, all of which involve the production of publications and recordings in various physical formats: Brick Press, Green Burrito Records and Total Distribution. Brick Press is a small print press and publishing project that provides a platform for emerging artists working with printed matter and documents contemporary art through the production of exhibition catalogues. Green Burrito Records is an independent record label he founded in 2010 that has released twenty-two albums and sold 2,500 physical copies. Total Distribution is a record label that focuses on releasing small-run, obscure, unreleased and unavailable albums, as well as electronic and experimental recordings from artists around the world. So far, fifteen unavailable albums now exist in a physical format. His recent exhibitions include a Brick Press residency at Sunset Terrace, turning a gallery into a conceptual publication studio and library, and Ryry’s Bodega, a storefront temporarily transformed into a non-profit, conceptual convenience store. Smith has participated in exhibitions around the world since 2005. Landfill Editions has a desire to explore the many avenues available to the contemporary arts publisher by not only producing books, but also textiles, drawings, paintings, ceramics and prints. Publisher Hugh Frost presents an overview of the press’ wide-ranging output, with particular focus on its narrative art anthology Mould Map 3. Landfill Editions is a publishing project based in Stockholm releasing artist’s books, comics, objects, prints, short fiction and science-fact since 2009. Their approach to project work combines a free editorial attitude with a love of presenting subtle, strange imagery. What are the key questions artists should ask themselves in defining standards for valuing their labour? Should artists professionalize or insist on a gift economy? Standard Deviation, a multi-phase project addressing these and other art and labour–related questions, began as a printed broadside and expanded into an online survey and day-long practicum. Helena Keeffe shares her findings from the practicum, a series of workshops organized in collaboration with the Arts Research Center at UC Berkeley in April 2014, led by artists, writers and activists convened from cities across the US. Helena Keeffe is an artist and organizer who makes projects and events in response to specific situations, people and places. Often involving direct, peer-to-peer forms of exchange and methods of alternative pedagogy, her projects have involved collecting oral histories, producing publications, organizing large public gatherings or intimate private dinners, and conducting workshops. Keeffe is the recipient of a Creative Work Fund grant and has created site-specific works in diverse contexts including city buses, an abandoned phone booth, a long-term-care hospital and a public park. She has also participated in exhibitions at the Yerba Buena Center for the Arts, the Oakland Museum of California and the New Children’s Museum in San Diego. Award-winning Nisga’a poet Jordan Abel’s second collection of poetry, Un/inhabited, maps the terrain of the public domain to create a layered investigation of the interconnections between language and land. Join the author for a performance, Q&A and book signing at VA/BF. Abel constructed the book’s source text by compiling 91 complete western novels found on the website Project Gutenberg, an online archive of public domain works. Using his word processor’s Ctrl-F function, he then searched the document in its totality for words that relate to the political and social aspects of land, territory and ownership. Each search query represents a study in context (How was this word deployed? What surrounded it? What is left over once that word is removed?) that accumulates toward a representation of the public domain as a discoverable and inhabitable body of land. Featuring a text by independent curator Kathleen Ritter—the first piece of scholarship on Abel’s work—Un/inhabited reminds us of the power of language as material and invites us to reflect on what is present when we see nothing. Jordan Abel is a Nisga’a writer from Vancouver. His debut poetry collection, The Place of Scraps (Talonbooks, 2013), was awarded the Dorothy Livesay Poetry Prize and was shortlisted for the Gerald Lampert Memorial Award. Abel is an editor for Poetry Is Dead magazine and the former poetry editor for PRISM international and Geist. His work has been published in many journals and magazines across Canada, including CV2, The Capilano Review, Prairie Fire, dANDelion, ARC Poetry Magazine, Descant, Broken Pencil, OCW Magazine, filling Station, Grain and Canadian Literature. His chapbooks Scientia and Injun have been published by above/ground Press and JackPine Press, respectively. Anteism, an art publisher from Victoria, BC, brings their mobile OuterSpace Gallery to VA/BF 2014. OuterSpace Gallery is a mobile contemporary art gallery founded in 2013. The gallery, housed in a customized cube van, is a small, personal exhibition space with a reach not accessible by brick and mortar establishments. The flexibility of the gallery allows for pop-up shows and honest immersion within different communities. OuterSpace exhibits challenging and pioneering artwork by emerging and mid-career artists. Our scale and mobility allow us to push boundaries beyond the ordinary or obvious. OuterSpace maintains a strong emphasis on the importance of artist books and conceptual/collaborative art projects. Through publications, our partnership with Anteism helps to document and showcase the work of exhibiting artists to a larger international audience. Sebastian Borckenhagen (Cape Town, South Africa) and Justin Gradin (Vancouver) both have extensive histories with small-run independent publishing and music production in their respective cities. Although Borckenhagen’s work has clear nods to African art, and Gradin’s to West Coast punk, they both embody a latent aesthetic dialogue previously rejected as naivete. Both artists employ separate means to explore comic art and sequential narrative. Borckenhagen looks to formalist drawing principles, while Gradin makes postmodern jabs and marginalized pop-cultural references. Curator Nathan Jones of Print Ready exhibition projects presents these artists’ work in a dance that skims across the boundaries of sequential print narrative, comics and continents. Nathan Jones is an artist, curator and one of the founding members of Print Ready, an ongoing Vancouver-based zine and art book exhibition series. He has a Bachelor of Arts from Emily Carr and a Bachelor of Education from Simon Fraser University. Jones’ art practice has its foundation in drawing and painting and he has worked in a wide breadth of media including independent and commercial film, musical performance, illustration and design for print. His work has been exhibited in Vancouver, Montreal and Tokyo. Currently he is one of the principal coordinators for Dynamo Arts Association. Sebastian Borckenhagen is an artist based in Cape Town, South Africa, who works in comics, animation and writing. He has been making comics and zines since 2005. From 2012 to 2013 he ran a popular weekly zine workshop, the Cape Town Zine Project, where participants could make zines on a Risograph. Borckenhagen also organized zine markets, where workshop participants and other artists were able to sell their zines. In 2013 Borckenhagen created two animated music videos for the band John Wizards. Justin Gradin is a visual artist, writer and musician who has shown across North America, the Netherlands and Japan, including his hometown’s Vancouver Art Gallery. For two years Gradin was also the music editor for the print magazine Color, which featured art, music and skateboarding. He has had seven art books published and has created dozens of self-published zines, many of which have sold out. Gradin has also been active in the community, running several artist and performance spaces, from L.A.’s Mime School to Vancouver’s Emergency Room. He currently releases records and publications on his Grotesque Modern label. The chapbook has taken on a variety of forms in the digital age. Produced by Poetry Is Dead and curated by the magazine’s founder Daniel Zomparelli, Sixteen Pages presents a series of sixteen-page digital chapbooks from around the world that visitors can view using a smartphone or tablet. Referencing the print publishing standard of a sixteen-page signature, the exhibition explores how poets and artists are transforming the chapbook from a physical format that is distributed locally to a form of digital media that can easily be disseminated around the world. Featured chapbooks are available for download throughout the Vancouver Art/Book Fair and will also be available online. Daniel Zomparelli is the Founder and Editor-in-Chief of Poetry Is Dead magazine. He is the author of Davie Street Translations (Talonbooks, 2012) and a podcaster for Can’t Lit. In 2012 he curated Arte Factum, an exhibition of print poetry chapbooks at Project Space’s former bookshop/gallery. Poetry Is Dead magazine is a semi-annual publication devoted to poetry in Canada with a strong emphasis on the West Coast. It is sixty-four pages of poetry, art, reviews and essays, and seeks to promote Canadian poetry with a focus on a younger generation of poets. Public Address is an ongoing project initiated by leannej and My Name Is Scot that began during their two-month stay at the Sofia Art Residency in Sofia, Bulgaria—which coincided with the first anniversary of the almost year-long public protests against government corruption in Bulgaria. Public Address explores notions of activism, authority and the ways and means of disseminating public and private messages. As part of the project, the artists collected zines and artists’ books by Bulgarian writers and artists, which are on display here. Featured artists include Sevda Semer, Alla Georgieva, Biliana Velkoa, Steven Guermeur, Kiril Prashkov, Lazar Lyutakov, Voin de Voin, artists from the Bulgarian Queer Forum, and Blood Becomes Water. leannej and My Name Is Scot are also launching their new book, Monument, published by Publication Studio Vancouver. Monument features images made by My Name Is Scot and texts by leannej that chronicle their two months of living and working in Bulgaria. leannej is a text-based artist. Her work has been published in books, magazines and anthologies, and installed in art galleries, public spaces and on the web. Her books include Long-Range Forecast Variable (2002), Re-reading the Riot Act (2011), Staying Beauty (2013) and Hope Chest (2014). My Name Is Scot works with text, installation, video and performance to explore issues of agency and authenticity. His work has been seen in exhibitions, screenings and performances in Canada, Europe, Asia, the Middle East, the United States, Africa and Latin America. You may also have seen his site-specific public art project across Vancouver’s Downtown Eastside, the evergreen project. Curator Sylvana D’Angelo presents the results of Zine Club, a year-long project during which twelve artists mailed each other one zine a month, resulting in each artist ending the year with a collection of twelve zines. Zine Club sought to exchange ideas and create an international community via the postal service. Currently based in Vancouver, Sylvana d’Angelo has shown her work internationally including exhibitions in Tokyo, Istanbul, Brooklyn, Portland and Seattle. She graduated from OCAD in Toronto for photography, earning a Bachelor of Arts, and has a diploma from George Brown in graphic design. Recently she studied abroad in Breda, the Netherlands, under the tutelage of Jonathan Barnbrook, Jan Van Toorn and Studio Squash. She looks forward to a solo exhibition at Dynamo Arts Association and a curatorial residency at UNIT/PITT Projects with Czech artist Anezka Minarikova. The VA/BF Library is an accumulation of books, magazines, zines and printed ephemera that is temporarily mounted at the fair each year. For 2014, artist and writer Sarah Davidson curates its presentation, titled New Understandings of Space. Sarah Davidson is a Vancouver-based artist and writer, and a regular contributor to the Project Space blog. She has a degree in journalism from Carleton University, and is in the final year of her BFA at Emily Carr. Sarah often creates artist books, alongside other projects, and has taken part in many recent group exhibitions and zine fairs, including Print Ready: Zine-a-palooza, Canzine West, VA/BF 2013 and LIBRO: The Liberation of the Book. For last year’s VA/BF, she created the book Wild with the support of Satellite Gallery. Enjoy free organic, fair trade coffee from our Official Coffee Sponsor Ethical Bean while viewing an exhibition of artworks from the Vancouver Art Gallery’s Art Rental & Sales. Travel mugs are encouraged. Purchase new, gently used and antiquarian delights—including duplicates, posters and library deaccessions in less than perfect condition—with all proceeds supporting the Vancouver Art Gallery Library. Artists, collectives, publishers, artist-run centres and art book distributors are welcome to apply to participate as exhibitors. Simply send a brief email introducing yourself and your publishing activities to [email protected]. Do you offer a product or service that is valuable to our visitors? Learn more about our comprehensive sponsorship packages by contacting [email protected]. Publishers who can’t attend the fair but would still like to share their books with our visitors, can donate two copies of any books, magazines, zines or printed ephemera to the VA/BF Library & Archive project and their books will be placed in a reference library that will be brought back to the fair every year. To participate, please contact: [email protected]. VA/BF relies on dozens of volunteers to effectively deliver our event. To register to help out, please contact [email protected].